Four drivers. $100. Here’s a quick look at Single Seater’s Fantasy IndyCar picks for the 2018 Kohler Grand Prix. Penske secured a front row lockout in qualifying of Josef Newgarden and Will Power. Newgarden was fastest in two of the three practice sessions and it carried over into the qualifying session as he won his third pole of the season. Scott Dixon has the highest expected points for the race despite his fourth row start. He has been on a great run so far this year with two wins and six top-fives in nine races. Dixon’s average finish on road and street courses is 5.0 as well, which shows in his price. He’s the highest cost driver with a price of $34. The pole-sitter is third in expected points at 25.8 and comes at a cost of $29, the fourth most expensive of any driver. Rossi will start fourth on the grid with 26.4 expected points. At $32 he is an expensive but worthy pick at Road America if you can afford him. 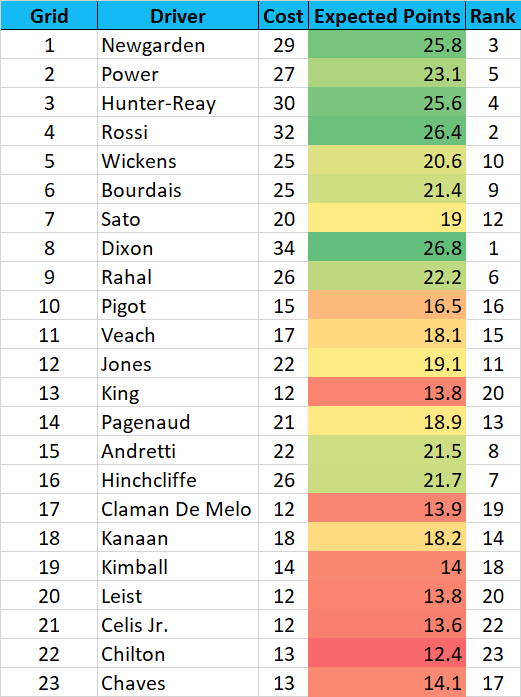 Further down the grid are Andretti and Hinchcliffe who rank high in expected points but aren’t in the top tier of cost. They will start side by side in Row 8 with comparable expected points values both in the 21 range. The five drivers starting directly ahead of them all have lower expected points. This is my team for the week! Let me know which drivers you decide to go with in the comments. If you have any Fantasy IndyCar questions, you can leave a comment below or send them at me on Twitter. Best of luck in your leagues this week!